The form of this large and extraordinary silver reliquary stupa very closely follows the Thuparama Dagoba (the first stupa to be built in Sri Lanka erected in the third century BC – dagoba is the Sinhalese term for stupa) and the golden reliquary that holds the Sacred Tooth, Sri Lanka’s most important Buddhist relic. (The tooth is believed to be an actual tooth of the Buddha saved from the Buddha’s cremation ashes.) 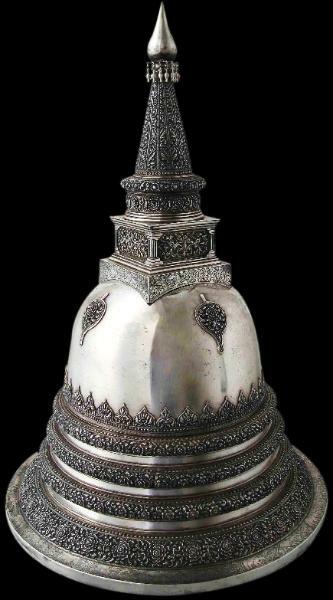 As such, it combines two of the most powerful forms to be found in Sri Lankan Buddhism with the highest level of Ceylonese silver-smithing. But what makes this dagoba reliquary all the more extraordinary is what it hides inside. dagoba and usually, they are made of two parts – a base and a bell-shaped cover. 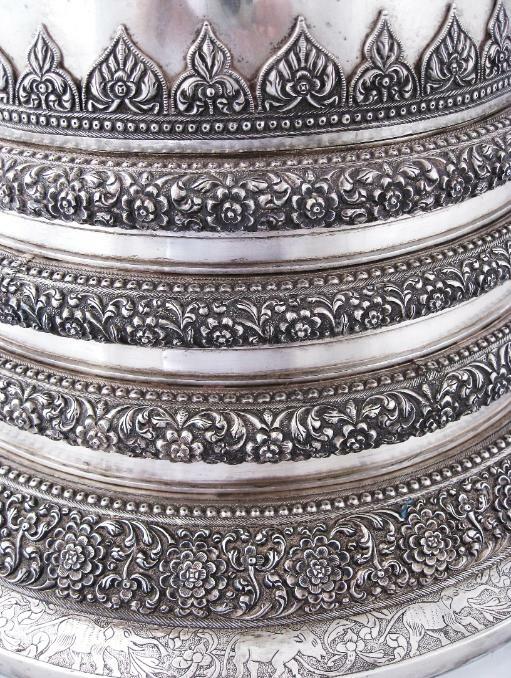 The base of this example comprises four tiers of receding concentric rings finely chased with typically Sinhalese tightly compressed flower motifs above a foot ring engraved with elephants and other animals amongst scrolling stylised Sinhalese orchid motifs against a tooled background. anda) rises to a square-shaped chamber known as a harmika. 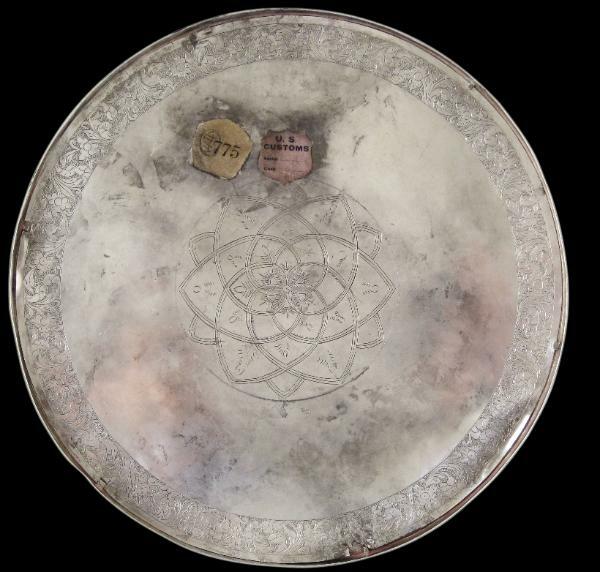 The anda is plain other than for four applied silver plaques chased with floral work. Each plaque is in the shape of a long-tipped bodhi leaf, the bodhi tree being the tree beneath which the Buddha preached and meditated before attaining enlightenment. The harmika and the cylindrical chhatravali above it are finely chased with more typically Sinhalese floral work. The chhatravali is festooned with a series of solid-cast bodhi leaf silver pendants suspended from silver chains. Above this rises a plain, cast lotus bud finial. The base is in the form of a doubled semi-circular moonstone found at the threshold of many stone entrances and stairways to temples and palaces in central Sri Lanka. An engraved border surrounds a central lotus pattern. 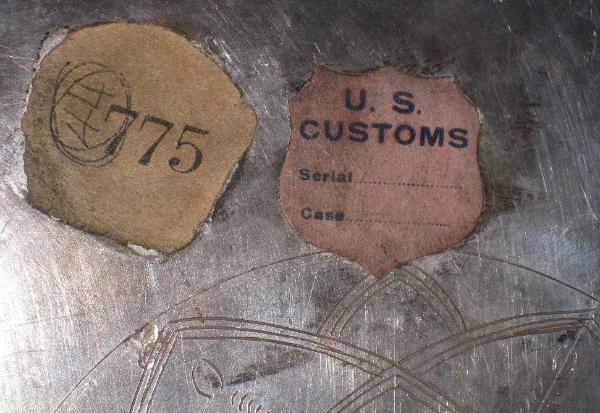 It retains two US Customs stickers which, judging from the typeface, look to date from the 1920s. 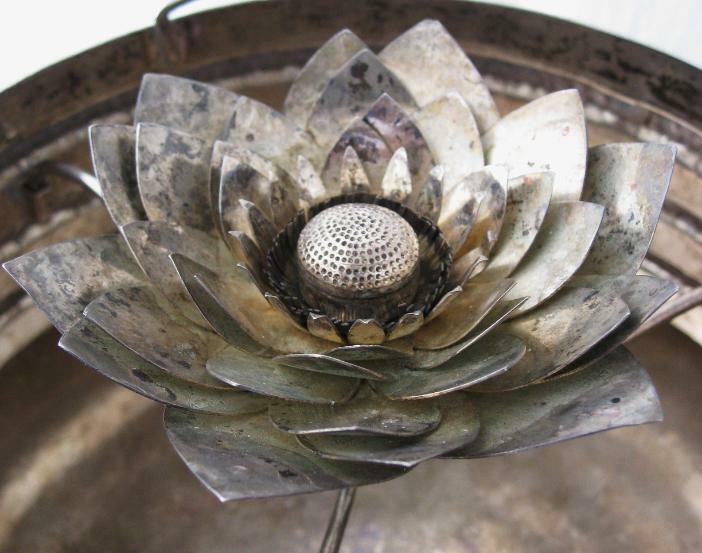 anda lifts off to reveal a complex lotus flower of multiple rows of petals, stamens and a centre, all in silver. The centre is in fact the reliquary chamber. It has a hinged lid which flips open to reveal a small chamber which might have held a tooth or some other relic of perhaps a highly revered monk. 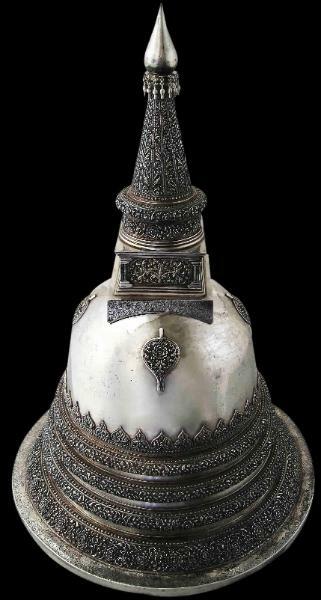 dagoba reliquary sent as a gift from Sri Lanka to Burma in the nineteenth century. 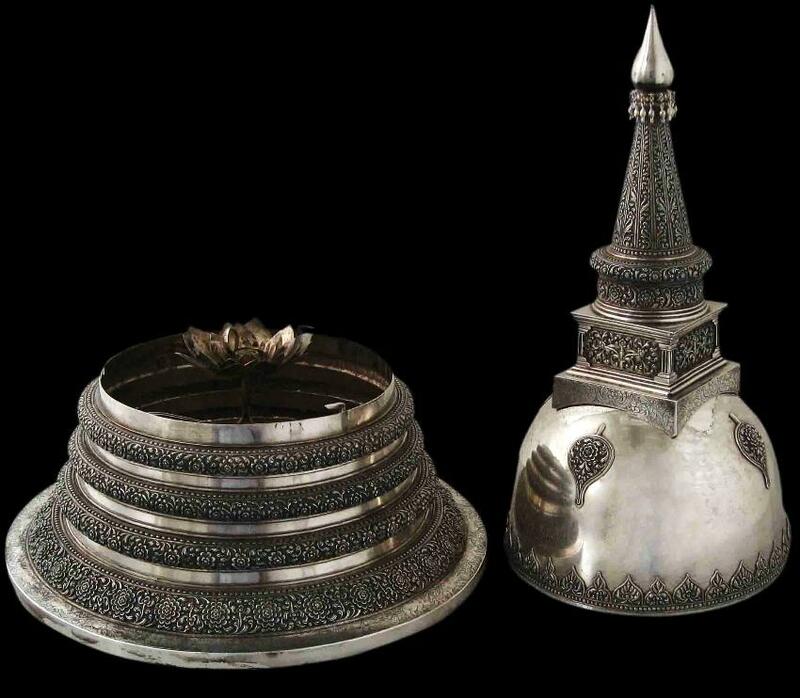 It was taken by British troops from the palace in Mandalay and now is in London’s Victoria & Albert Museum. The V&A example has four bodhi leaf plaques applied to each corner of the dome in the way that this example does. The reliquary that holds the Sacred Tooth also follows this. And the tooth is kept inside the casket on an open lotus flower that is made of metal, presenting another parallel with this item. perahera parade associated with the Festival of the Sacred Tooth Relic at Kandy, the last seat of the Sinhalese kingdom, sees the reliquary that holds the sacred tooth paraded around Kandy. 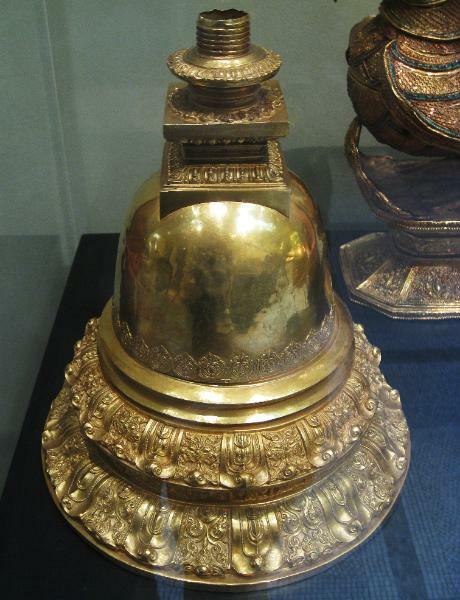 The golden dagoba reliquary in which the Sacred Tooth is kept is placed on a canopied howdah on the lead elephant’s back. Dewale (main shrines) of poles cut from a certain tree. The tusker usually walks on a long white cloth spread before it. A group of singers (the kavikara maduva) and musicians proceed ahead singing in praise of the Tooth Relic. The Diyawadana Nilame (Custodian of the Tooth Relic) walks behind accompanied by his assistants. Skilled dancers and drummers accompany them and symbolic weapons are carried too on either side. Overall, this is a rare and large piece that combines extraordinary presence with astonishing craftsmanship. We are not aware of any similar examples in silver either having been published or to have been available on the international art market in recent decades. Coomaraswamy, A.K., Mediaeval Sinhalese Art, Pantheon Books, 1956; Singer, N., ‘The gold relics of Banu Thau’, Arts of Asia, September-October 1992; Phoenix Art Museum, Guardian of the Flame: Art of Sri Lanka, 2003; and Pal, P., Art from Sri Lanka & Southeast Asia: Asian Art at the Norton Simon Museum, Yale University Press, 2004. 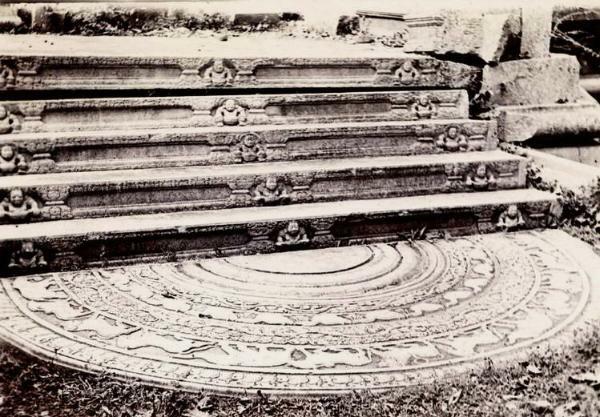 Carved moonstone at the start of the steps Anuradhapura palace, photographed around 1900. Monnstone entrances such are the inspiration for the engraved base of the stupa reliquary. 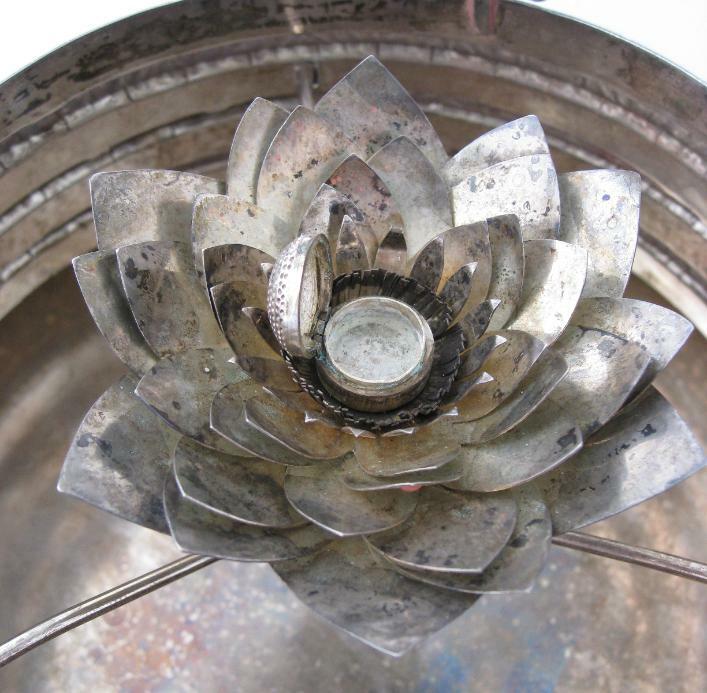 The silver lotus flower inside the stupa and the reliquary compartment at the flower’s centre. Old US customs labels attached to the base of the stupa. 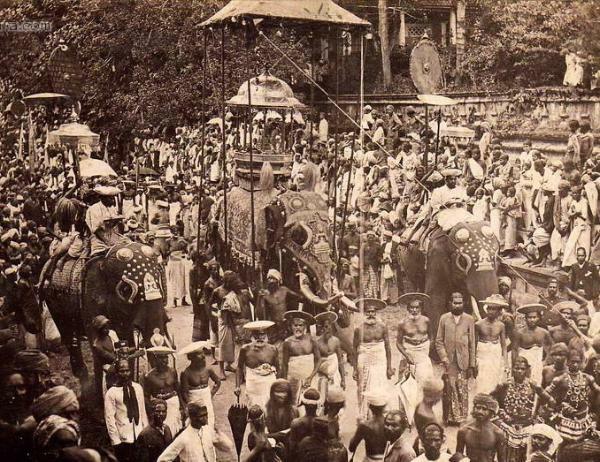 An early view of the annual perahera parade associated with the Festival of the Sacred Tooth Relic at Kandy. 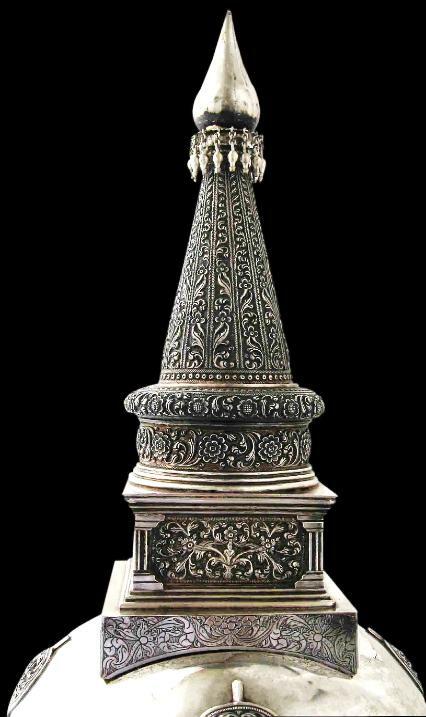 The reliquary that holds the Sacred Tooth is on the howdah beneath the canopy of the central, lead elephant. 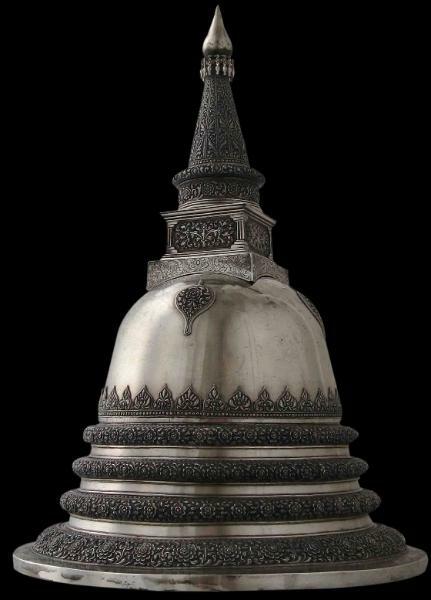 A Burmese/Sri Lankan reliquary stupa currently on display at London’s Victoria & Albert Museum. However, this is not the stupa referred to in the text above but another example.